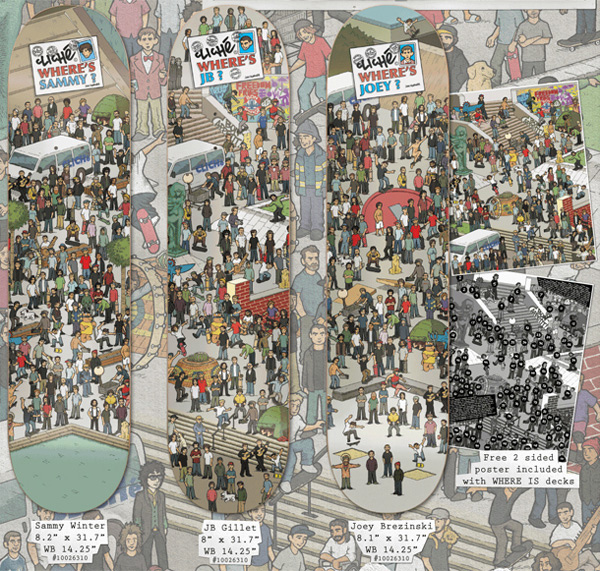 British illustrator Jon Horner has laced out a series of Cliché skateboard decks, the theme of which applies Horner’s well known “Where’s Waldo” treatment to stars in skating culture. Pros like Joey Brezinski, JB Gillet and Sammy Winter hide cleverly in the graphics for the French decks, challenging you to find (and guess) all the possible characters. Boards measure in the neighborhood of 31.7″x 8″, with each of the three board designs featuring their own celebrity. Two-sided poster included with every board.